I may be based in London right now, but doesn’t mean that my heart isn’t always back home in LA, too! I’m thrilled to introduce you to some of my LA Glam Squad correspondents including my “Big Sis” Maxine of Vanity Girl Hollywood. Every now and then if something fabulous is happening in LA that I can’t attend myself, I’ll have my glam correspondents report back for me! It was so lovely to get a brief break from this unusual rain here in LA! This particular Sunday, it meant only one thing for me: Sunday Funday a.k.a. 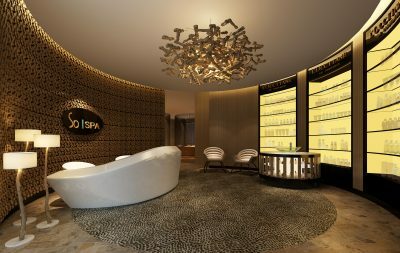 mimosas and pampering at LA Travel Magazine’s Spa-cation event at The Sofitel’s SoSpa. Location, location, location: I live, work and play in West Hollywood and The Sofitel occupies a unique position where LA, WeHo and Beverly Hills all sort of converge. Their patio is particularly charming and is the perfect oasis for a pampering event in the middle of our bustling city. SoSPA: The Sofitel features a beautiful spa (managed by two girl bosses, Gia and Angela) and we sampled treatments like this chair massage (above) this past Sunday. Click here to see a full menu of their offerings. Braid Bar: A braid bar is always such a fun idea. 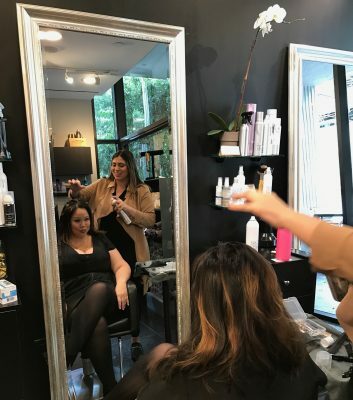 I tend to shy away from a full-on facial or anything where I have to remove my makeup when I go to a beauty event, so getting braids is an easy way to mix things up while sipping a glass of champagne. Thanks Gia for giving me a mini makeover! Cute Bites! Alligator Pear Catering offered girl-friendly small bites perfect for in-between pampering sessions. Bonus points for the cute Brandon who whisked us away to the side patio once we checked in to hand us a glass of champagne and a little nosh. Hand Treatments: Our hands work hard and are one of the first places to show age, and the Spa-cation offered up everything from mini manis by Nailbox LA to anti-aging light treatments by Diana Ralys Skin Health. Consultations: FIVE STAR Fitness LA is the elite squad running the swanky gym at SoSPA where clients are also able to use the spa showers and other amenities making this an LA Luxury workout for locals and hotel guests alike. All in all, it was a great Sunday Funday Spa-cation. Thanks for having me LATravelMagazine and Sofitel!